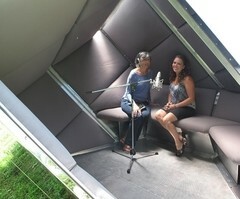 The Sound and Story Project's new transportable recording booth, The Cube. Since 2007, Eileen McAdam has engaged in the almost forgotten art of storytelling. She has spent these last six years traveling about the Hudson Valley capturing and sharing the stories of locals as part of her nonprofit organization Sound and Story Project of the Hudson Valley. Now, with the project established and flourishing, McAdam has introduced a new innovative mechanism to help record people's stories in a much more relaxed fashion: The Cube. Though many may walk by this architectural structure encased in mirrored metallic panels and think nothing of it, those who participate in McAdam's Sound and Story project will learn that it's what's on the inside that counts. Participants will enter The Cube and find luscious cushions, sound proof walls, and a microphone to privately and comfortably share their history. This Hudson Valley treasure can be dismembered and assembled in hours, making it perfect to travel around with McAdam in her journeys. The Sound and Story Project of the Hudson Valley launched on one fateful day when McAdam accompanied Jim Metzner on a field trip while he was teaching a class at Vassar College. With tape recorder, headset, and microphone in hand, McAdam fell in love with the recording process and quickly brainstormed what came to be the current nonprofit organization. The projects aims to extract the moving moments of people's lives while in the Hudson Valley to not only share the beauty of the place, but to also further link human beings and promote community. McAdam speaks of the project's significance, stating, "Stories connect us to each other. As well, they keep us connected to the place we live. The more you’re connected to that place, the more likely you are to be a better steward of that place." Now, with the invention of The Cube, McAdam can expand her goals and further connect both people, place, and community. 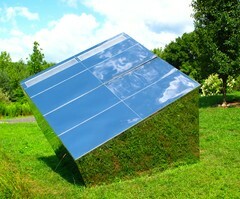 The Cube will debut on Sunday, September 15 at Stone Ridge Library in Stone Ridge. Other locations will include The Hudson River Maritime Museum, The Nyack Library, Somers Historical Society, New Rochell Public Library, and Roosevelt-Vanderbilt National Historic Site. Two Hudson Valley residents share their stories in The Cube.